The first prototype which was built in AZUB was the really first one which had quite a lot of child mistakes and which was without painting and quite ugly. 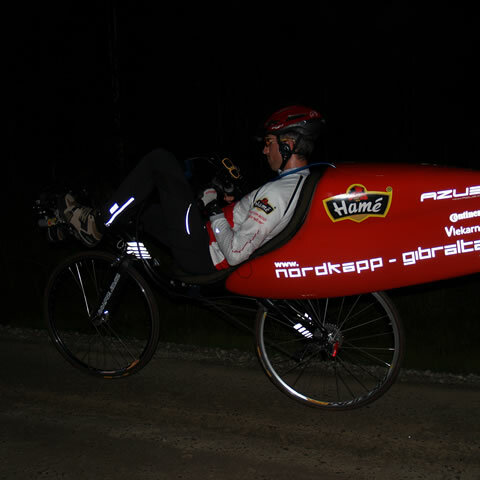 The second one was prepared for the Hame Nordkapp – Gibraltar non – stop ride expedition and it has quite a few special technical details. The biggest problem was that we had to have just one bike for 8 different riders. And even the biggest tall difference was 35 cm between Eva and Sjaak what is quite funny because they are a couple. Also we had to use three different seat sizes which are available from AZUB – M, L, XL. We thought that we will made have some solution for stretching of the chain and we will be able to move with the front boom, but we have realized that this is almost impossible, so we started to prepare a frame with special seat mounts and also the seats were modified compare to standard AZUB seats. And because AZUB has dozen experiences with adjusting of the seat positions and because the Highracer is developed also for small riders, finnaly it was not such a big problem to build a prototype which has the possibility of changing the seat positions of 35 cm include changing of the tailbox in less than 6 minutes. If you see the pictures, you are right, both, the shortest version for Eva and the longest one for Sjaak looks a little bit funny but they could easily ride on the bike for hours and hours. And also you can see that Eva disn't use the tailbox, because it is not designed for M seat size and Sjaak had a special stays in rear which supported the seat. Many other special details had to be prepared before the start of the expedition. 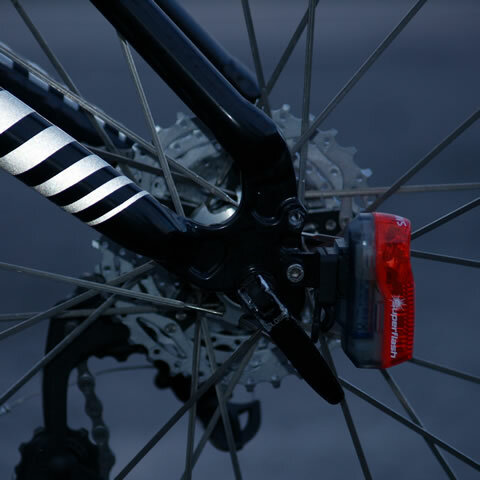 Because it was expected that the bike will spend many and many hours riding in the night we had to solve also lights. For the front light we used high end technology which was made by Martin and we used also hub dynamo of well known brand. 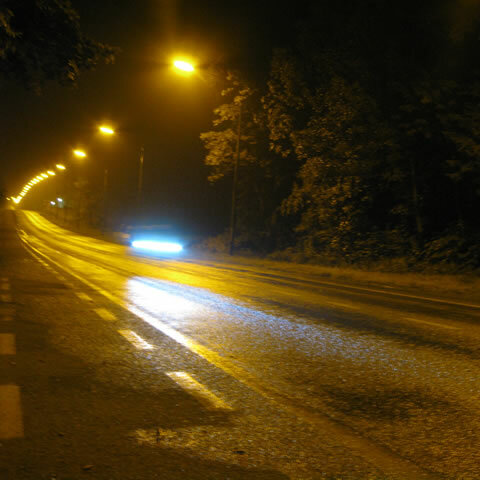 Just before the expedition we have realized that the resistance is so low that we can use the front light all the day which increased our safety a lot. Also the rear standard LED diods battery light we used all the time and we chnaged the batteries only once. The stem of the expedition prototype of Highracer were also special and it was necessary to adjust it in lenght of about 20 cm, so it had three pieces and some of these pieces were removed or added accoring to the rider. 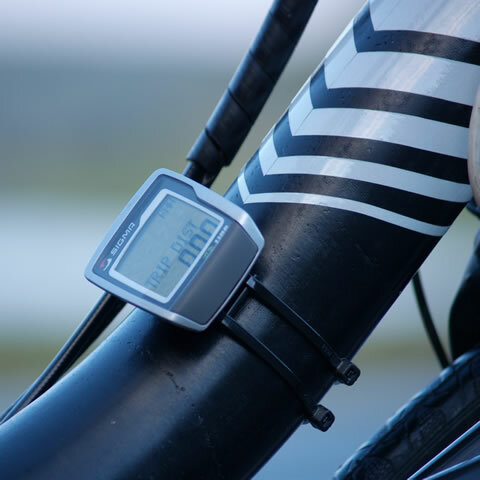 On the bars there were mounted a GPS holder and walkie talkie for better communication with support car. For increasing of our safety all the stickers on the tailbox were reflective and we add also some reflector stickers on the frame. There was a long discussion about components which the bike has. We were quite afraid that using just a road components with large chain wheels and small cassette in combinantion with large 700c wheels would make us a problem climbing of the Pyrenees or some other hills especialy if we are tired. So finnaly we combined a trekking cranks with MTB cassette and it was perfect. It was enough fast a very comfortable in uphills. We had a combo SPD pedals because some riders prefer open shoes without SPD. The rear wheel was a wheel set from Mavic. 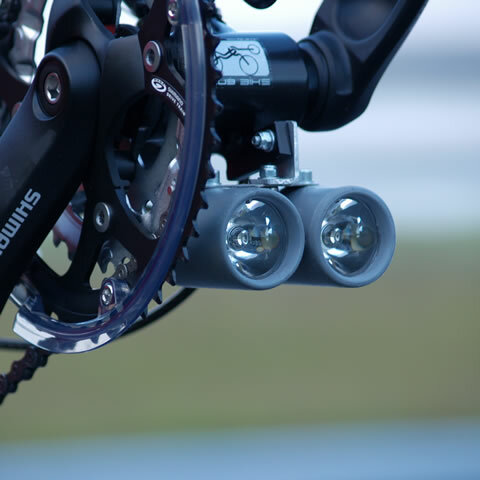 The shifting system was from SRAM. Tires were from Continental the Grand Prix four season and they last all the 6153 km with only three defects on very very bad gravel roads and we think it is big success. 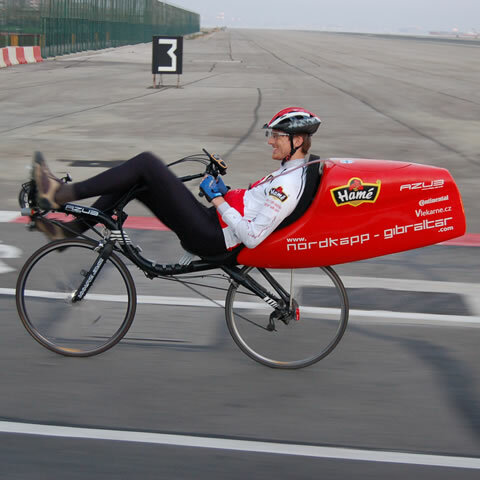 We have realized that the Highracer project is very comfortable and fast recumbent with many advantages but also with some margin problems which we have to solve. But we can easily say that we have already had a very good highracer. Will there also be a highracer with a 26 inch front wheel for persons with an "inside leg length'' of 84cm? 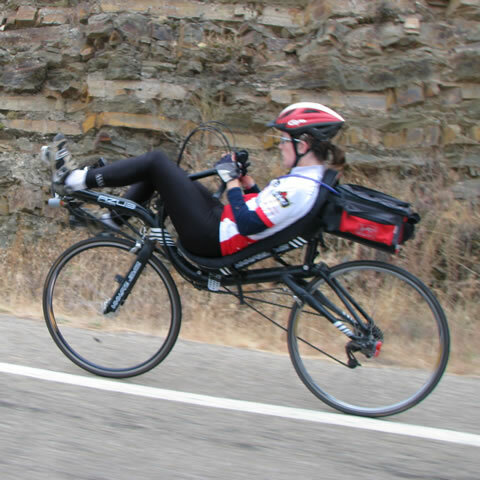 It is not definetely the same recumbent. Meta Bikes is a new brand but AZUB BIKE is 7 years on the market. The high racer is still not available on the market in Europe nor in USA. We plan to introduce the final version during 2008.